by Sylvester K. Stevens and Donald H. Kent. Hardbound, 342 pages, 6" x 9". 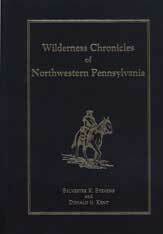 The northwestern Pennsylvania wilderness was the scene of many events which had great significance on the history of Pennsylvania and the nation. Here it was that the legions of France buried their leaden plates, erected their forts and staked out a claim to the continent of North America. Here it was also that the red-coated agents of England resisted the French bid for empire. Across this trackless wilderness there trekked as the agent of Virginia, to warn the French from the Ohio Valley, none other than the young George Washington. This journey to Fort Le Beuf was his first great public service and the launching of a career which culminated with his services in the of our republic. Wilderness Chronicles gives much credible evidence on the region's connection to the making of America. This book is not meant as a history of the region but rather a collection of raw materials from which the history was written.